UN undersecretary general for political affairs Jeffrey Feltman has asked Russia to increase its staff in UN global peacekeeping missions. During a meeting with Russian interior minister Vladimir Kolokoltsev, Feltman, also praised the expertise of Russian peacekeeping troops and their contribution to global peace. “Our peacekeepers are in great demand. 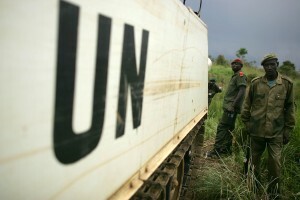 We have been asked to increase the number of peacekeepers involved in UN peacekeeping operations,” Kolokoltsev said. He also offered Russia’s help in training peacekeepers and said it is ready to boost its presence in peacekeeping missions. Currently there are 80 Russian police officers serving with eight UN peacekeeping operations. Last week, UN secretary general Ban Ki-moon visited a training centre in Russia’s town of Domodedovo, and lauded the facility for its high standards and efficiency. During the meeting Kolokoltsev and Feltman covered a wide range of issues, such as strengthening cooperation on law enforcement, information security and combating international drugs trafficking.